These recent words spoken by Bishop Tracy S. Malone echo her Annual Conference Episcopal Address message that congregational health is a priority of the East Ohio Conference this quadrennium. 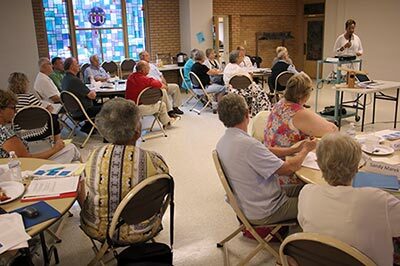 “The overall health of the church, and the overall vitality and effectiveness of ministry, largely depends on how pastors and churches handle conflict, disagreements and relationships,” Malone told 50 clergy and laity during their August training session on the principles of the Rule of Christ. “Rule of Christ was designed by the late Rev. Terry N. Gladstone, a Deacon in the Michigan Area, as a way of applying Jesus’ teachings from Matthew 18 to the life and relationships in the local church,” said the Rev. Arlene Christopherson, the assistant to the bishop and the director of Connectional Ministries in the Northern Illinois Conference, who led the session. Jesus tells us to take time to examine our role in a conflict. Others can help the parties see possibilities. Use the resources of the church. Some issues cannot be resolved. God has promised to be with us in the midst of our problems. The pastor and the staff parish chair of each church that had a pastoral change in July will receive a letter from the episcopal office that introduces the Rule of Christ process, identifies the church’s trainer, and sets expectations for arranging the training session. Throughout the training process, trainers are under the supervision of the district superintendent of the church to which they have been assigned. “The goal of this work, of this ministry, of this tool, of this resource is to increase and to cultivate congregational health,” Malone said.